A permanent temple for Shirdi Sai Baba, a place of worship and a spiritual retreat for the expanding devotee base in the New England area, a center for community services and outreach and much more – As a first step towards fulfilling this divine mission, New England Shirdi Sai Parivaar (NESSP) which operates the Chelmsford, MA Sai Baba temple is holding groundbreaking celebrations for a brand new Shirdi Sai Temple in Groton, MA on Saturday, 29th August, 2015 from 9 AM. Consul General of India — New York Ambassador Dnyaneshwar M. Mulay will attend this event and also participate in the Samuhika Homam. NESSP Cordially invites one and all on this occasion. NESSP humbly solicits your presence on this occasion to be part of what is truly a once in a lifetime event for the Sai community in the New England area. NESSP is a 501 (c) (3) non-profit organization and currently operates the Shirdi Sai Baba temple out of a leased facility in Chelmsford, MA. In addition to a full calendar of daily puja services and special event celebrations year round, the temple also offers yoga and meditation sessions, cultural and academic activities aimed at kids such as dance, music, learning Vedic scriptures and competitive chess. The temple is also a focal point for a number of community based initiatives such as Red Cross blood donation drive, free health camps, disaster relief operations, winter clothing drives and food to homeless shelters. The list of initiatives is expanding along with the devotee base which is attracted to Shirdi Sai Baba, His philosophy and teachings and the Parivaar’s vision to spread them. NESSP has about 4000 families as its members across New England stretching from Maine to Rhode Island from what started as a close knit devotee base of about 40 families just over a decade ago. With blessings of Shirdi Sai Baba, steadfast efforts by a dedicated volunteer base and community support, the moment has arrived to commence the construction of a permanent temple which is expected to be done in phases. 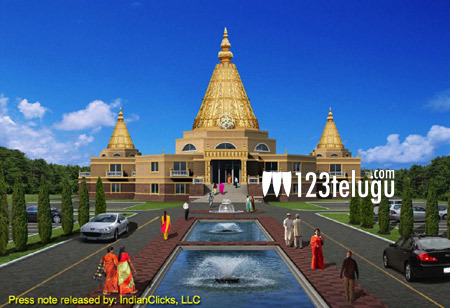 The Sai temple will be situated on 28 acres of serene land in Groton, MA with easy access to major highways. The temple complex will house a magnificent two-story building with about 40,000 square foot of space with a prayer hall seating 500 people, a multipurpose hall with a kitchen for community events as well as individual classrooms for cultural and kids related activities besides providing adequate parking. This new facility in addition to temple services is expected to accommodate with ease, the numerous NESSP initiatives and carry them further along besides supporting newer ones. Several fundraising options have already been launched until now to accomplish the initial phase of construction estimated at 7 million dollars. Some of the fundraising options include contribution of dollar a day, the Divine tree leaf, the Divine brick and the more recently announced Shraddha and Saburi interest-free loans. More details can be obtained from www.nessp.org/donate. To support a project of this magnitude and scale, NESSP appeals to the New England community for financial and volunteer support and participate wholeheartedly in this Divine endeavor. This verse highlights the importance of association with like-minded devotees leading to peace, harmony and eventually salvation. NESSP strives to provide a platform for the extended devotee family through the permanent temple initiative wherein the temple will serve as an anchor point for spreading Sai Baba’s message and teachings not just during the present time but for decades to come. As a community in New England, it is an opportune moment to heed to NESSP’s clarion call “Together we can, Together we must and Together we will build the Sai temple”.